Holds any standard core roll tissue up to 5″ (127 mm) diameter. Die-cast of Zamac in seamless one-piece construction. Back includes two (2) perforated lugs for wet wall anchoring and two (2) dimpled holes for dry wall installation. 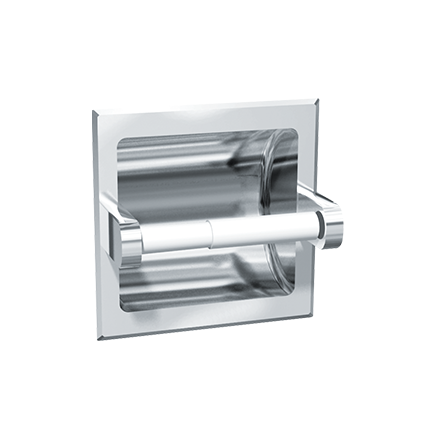 Dry wall clamp will be supplied for dry wall installation. A plastic, spring-loaded, removable roller held between two (2) solid bars holds paper roll. All exposed surfaces are triple plated with copper, nickel and chrome to a mirror finish.